The twenty chapters of this volume are revised versions of essays published during the last twenty-five years in a variety of journals and collections. They are studies of works belonging to five different genres and written by fourteen Russian and Soviet writers, poets and dramatists ranging from Pushkin to Akhmatov. Most of the chapters are devoted to individual works; the problems discussed in others relate to groups or cycles of works or even to the entire oeuvre of the writer concerned. Nevertheless, they are connected by their common concern with the problem to which the volume's title refers. In each case the initial impetus to write came from some aspect of form -- a distinctive feature of style, language, narrative method or characterization, an unusual structural principle or genre characteristic, a recurrent image, a striking rythmic variant of a particular metre -- which raised at once the question of the reasons for its choice or presence and thus of its relation to the meaning and purpose of the work or works concerned. 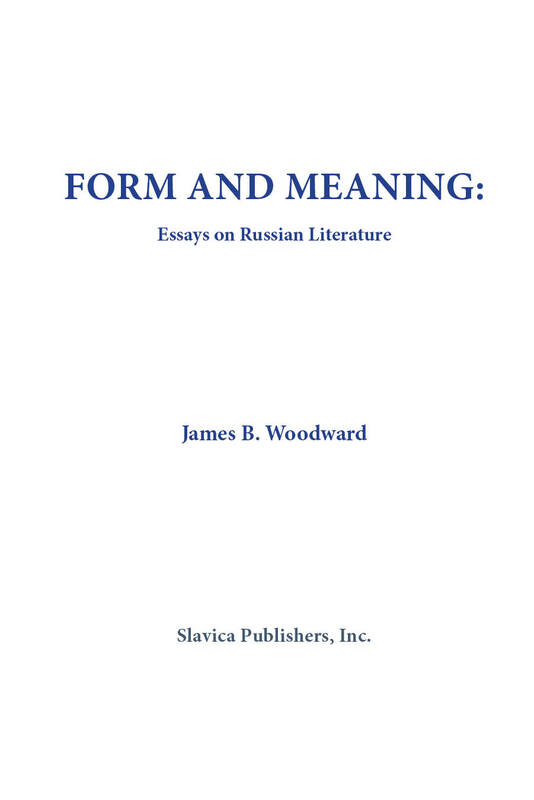 This relationship is examined in different ways, but the aim throughout is basically the same: to contribute to the understanding of some of the most notable works of Russian literature by suggesting answers to questions posed by their formal characteristics. The details of first publication are indicated in each case at the beginning of the Notes to the relevant chapter. Contents: The "Principle of Contradictions" in Evgenii Onegin; The Enigmatic Development of Baratynskii's Art; Gogol's Mertvye dushi: the Epic as Analogue; Turgenev's Prizraki: a Reassessment; Turgenev's "New Manner" in His Novel Dym; The "Roman Theme" in Turgenev's Nov'; The Symbolism and Rhythmic Structure of Turgenev's `Italian Pastiche'; Overlapping Portraits in Dostoevskii's Idiot; "Transferred Speech" in Dostoevskii's Vechnyi muzh; Tolstoi's Khadzhi Murat: the Evolution of Its Theme and Structure; Leonid Andreev and "Conventionalism" in the Russian Theatre; The "Symphonic" Art of Ivan Bunin; Rhythmic Modulations in the dol'nikTrimeter of Blok; The Structure and Theme of Blok's Cycle Iamby; "The Idea of the Circle" in the Poetry of Blok; Semantic Parallelism in the Verse of Akhmatova; Rhythm and Meaning in the Alexandrines of Mandel'shtam; The "Dotted Line" of Iurii Trifonov's Last Novel; The "Cosmic" Vision of Iurii Dombrovskii: His Novel Fakul'tet nenuzhnykh veshchei; Chingiz Aitmatov's Second Novel.